Since my last exhibition two years ago (Michael Munday: Through Still Life) I’ve been working abstractly, leaving behind (mostly) images of ‘things’. So there are no stories in this exhibition – these paintings are about shape, colour, line, texture and, sometimes, they venture into the third dimension. They can be divided into two categories: painted before, and after, a recent trip to Kerala, South India. There I was very influenced by the bright colours of houses, clothes, sky, advertising, temples, and of course, something of the iconography of Kerala. But nothing in the paintings is to be taken literally. Here is a selection from the exhibition. 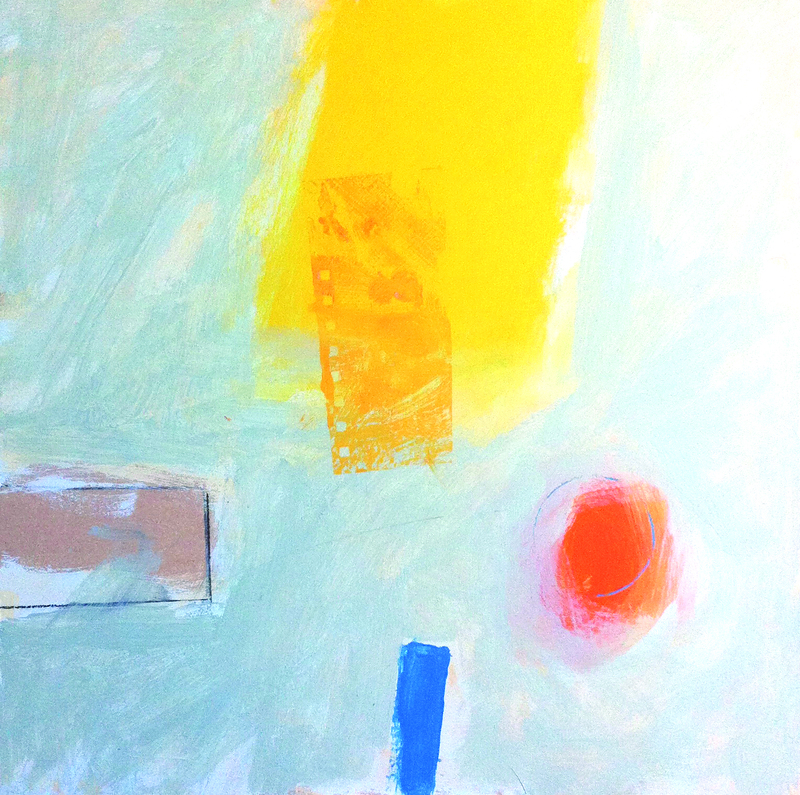 All paintings are 40.5 cm square, mixed media on panel, floating, in white frames. Still life: for many years a favourite subject. From commissioned illustration way back in the 1970’s and ’80’s (often food) through to today’s paintings, I’ve loved the composition of the domestic. Initially those illustrations were supposed to suggest a concept (those were the days), but the ingredients – jars, bottles, glasses, bits and pieces from around the house – took on their own life. The shapes were enough to work with. The silhouettes became the material. No ‘meaning’. So working with, from, and through still life, came this series of paintings. All were painted over the last eighteen months, through the joy of shape; through observation, play, and accident. These have become progressively more abstract, yet underlying each is the nature of things. This is an exhibition of a selection from the ongoing series: just ten paintings. Through still life.